"These were inspired by a cook named Ana, a Brazilian food blogger living in Italy. 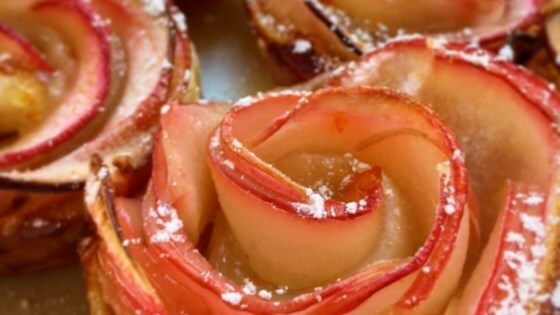 I really hope you give these gorgeous looking, and very delicious apple roses a try soon. Enjoy!" Spread melted butter over dough; top with a generous amount of cinnamon-sugar. Place apple slices along 1 long edge of dough, about 1/4 inch beyond edge of dough, overlapping slices slightly. Fold bottom half of dough over the apple slices to form a long "folder" of dough with rounded edges of apple slices exposed. Starting from one end, roll dough not too tightly to form a rose-shaped pastry. Seal roll with end of dough strip. Bake until well browned, about 45 minutes. Remove ramekins with tongs and place on baking sheet to cool 5 to 10 minutes. Remove apple roses from ramekins and finish cooling on rack. Dust with confectioners' sugar before serving. Dessert made from puff pastry, apples, and cinnamon sugar, shaped as roses. If you don't have a microwave, just sauté your apple slices in a little bit of butter over medium heat for about half a minute per side, or until flexible but not soft. Nutrition data for this recipe includes the full amount of the puff pastry, not just what is needed for this recipe.